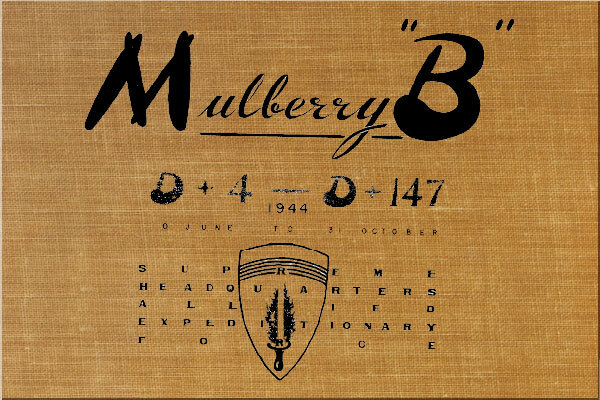 In the planning of Operation NEPTUNE the term MULBERRY "B" was defined as, 'An artificial harbour to be built in England and towed to the British beaches at Arromanches." The sheltered water provided by this harbour was to make the landing of a portion of the initial build-up of stores and personnel independent of the weather. A constant flow of supplies to the forces ashore was vital to the success of the operation and could not be interrupted by spells of bad weather that might hold up landings over the beaches. That MULBERRY "B" actually did far more than the job for which it was intended, despite storms of intensity far beyond that for which it had been designed and despite the total loss of its deep water breakwater, is the success story of a military and naval operation unsurpassed in the history of warfare. From the time it was put into operation, four days after D-Day until the 31st of October, 1944, 628,000 tons of supplies, 40,000 vehicles and 220,000 troops were put ashore in the sheltered area afforded by MULBERRY "B". Expressed in another way, 35% of the British stores, 17% of the British vehicles and 23% of the British personnel were landed inside the Mulberry. From D plus 4 on it had been planned to handle 6,000 tons of stores a day at MULBERRY "B", actually, however, from the 20th of June to the 1st of September the port averaged 6,765 tons a day. For the month of November the British plan to bring in three MT ships a day and the U.S. intend to land 11,500 tons of stores a day from Liberties. It is planned to close the port the 1st of December, 1944. With a port that is apparently so successful the obvious question is, why discontinue it? For this there are several answers. The winterization of MULBERRY "B" would be extensive and call for heavy drains on valuable stocks of material and manpower. The railway net is fully occupied with U.S. cargo from Cherbourg and British movements of supplies along their L of C. The road net in and around the port would require extensive repairs. The port is now a considerable distance back on the L of C. With the other ports already available and the expected imminent opening of Antwerp, sufficient port and harbour space will soon be available. 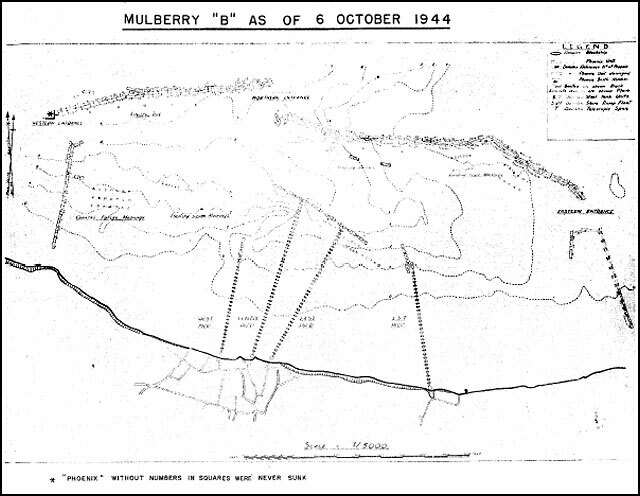 The following report shows in chart and graphical form the part that MULBERRY "B" has played in this operation. 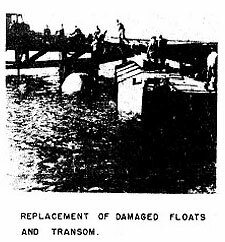 Concrete caissons for use as breakwaters when sunk in 5.5 fathoms or less. There are six sizes which vary from about 2,000 tons to 6,000 tons. Each unit required two large (759 H.P.) tugs to tow it; the average speed being 3 knots. 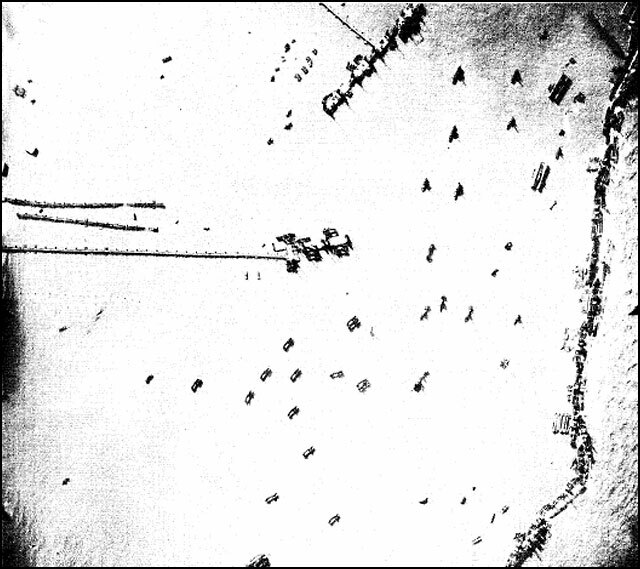 Blockships that were planned to be sunk in 2.5 fathoms or less to form breakwaters. To provide a sheltered beach for landing craft to use in the event of strong onshore winds. To provide a refuge for ferry service and other small craft in rough weather. Military piers and pierheads for discharge of coasters and LSTs - LCTs directly to shore. This equipment was designed to ride out rough weather. The pierhead part of WHALE. These can be used as a pierhead for unloading stores from coasters or vehicles from LSTs and LCTs. It consists of a floating pontoon 200 ft. long which rides up and down with the tide on four pillars or "spuds". When in tow these spuds extend below the pontoon to a draught of 7 feet. The beam is 60 ft. and tonnage 1,760 tons, with its attached intermediate pontoon. The roadway part of WHALE. These link the pierhead to the shore and consist of 80 ft. steel girder bridge spans supporting a single way road, carried on "Beetles" (concrete or steel floats). Beetles are designed so that they function in shallow water or fully aground, the steel type being used over rock. 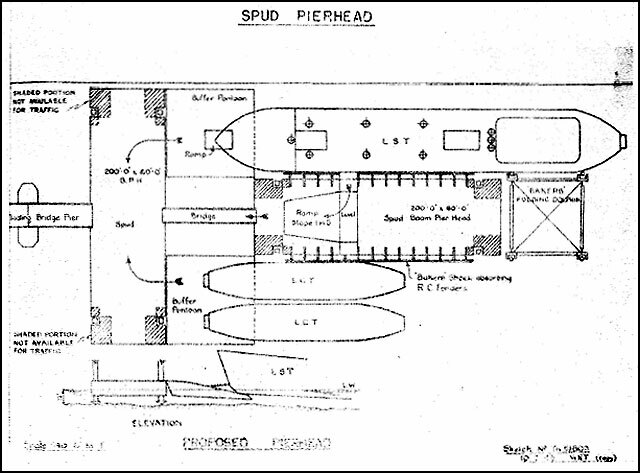 Tubular structures, 126 tons displacement, which when erected, act as rigid extensions to the spud pierhead to secure the stern of the LSTs which is longer than the spud pierhead. When in tow they are folded somewhat similar to a deck chair. 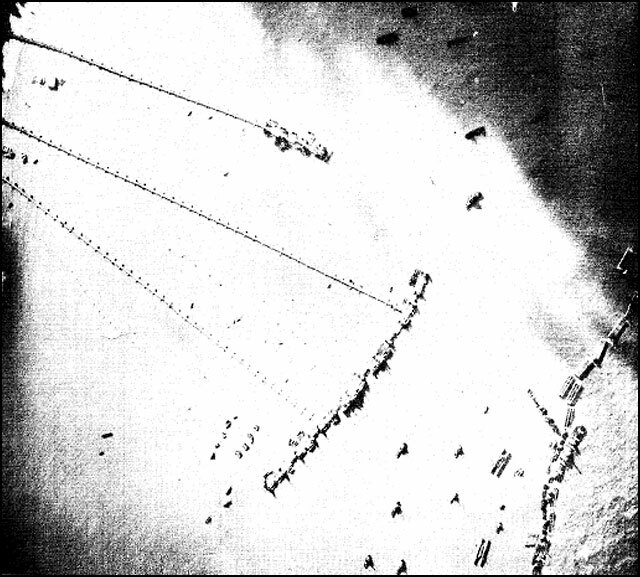 Draught - 20 ft.
200 ft. long cruciform floating steel structures which moored end on in a line, form a shelter in an outer deep water anchorage outside the Phoenix breakwater. Behind this Bombardon breakwater it was hoped that shelter would be found for the unloading of Liberty ships. Dimensions: Length - 200 ft., Beam - 25 ft., Draught - 19 ft., Dead weight - 1,500 tons. Replacement of damaged floats and transom. Tank crossing bridge at 40 m.p.h. This photo shows a part of the beach at Arromanches protected by MULBERRY "B". 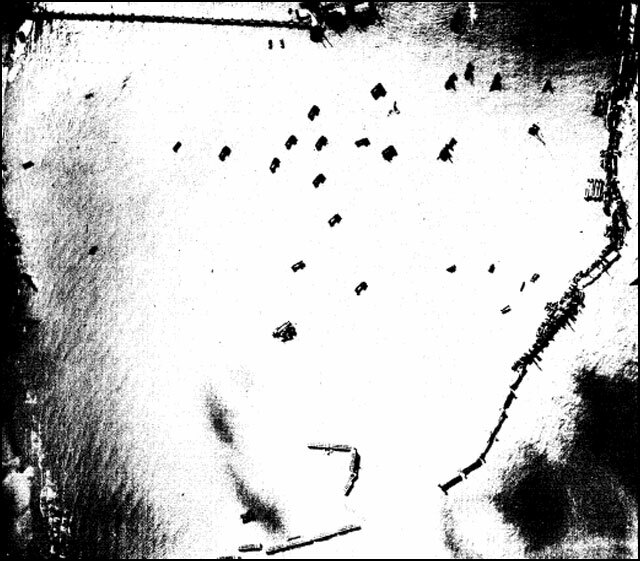 The beach, some of the landing craft, part of the road net and storage fields are shown. This photo and those following were made on the 27th of October, 1944. In this photo it can be clearly seen the protection afforded by MULBERRY "B". 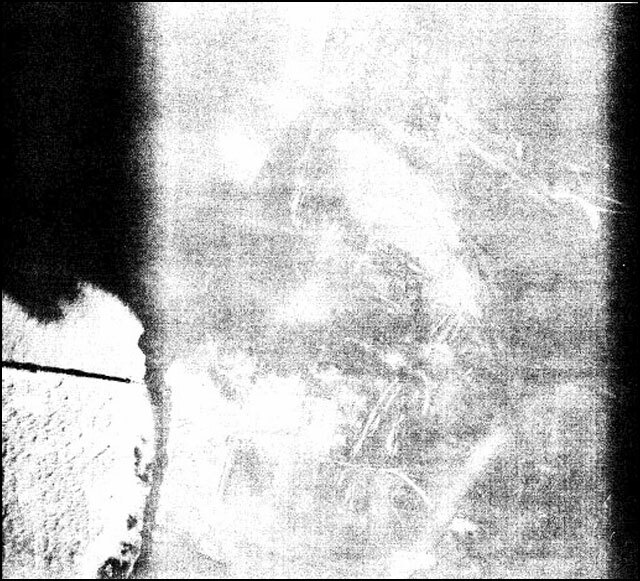 In the lower left hand corner a comparison can be seen between the water inside and outside the harbour. The PHOENIX shown here have been winterized, that is partially filled with sand and the tops covered over. Shown here are the PHOENIX breakwaters and the Western Entrance. The deterioration of some of the units can be seen. The majority of the units shown have been winterized. Again the smooth water within the harbour can be noted. Shown here is the Northern Entrance to the harbour and also a view of some of the old and new PHOENIX units. It will be noted that some of the units are open, some closed and some with man holes cut in the top. 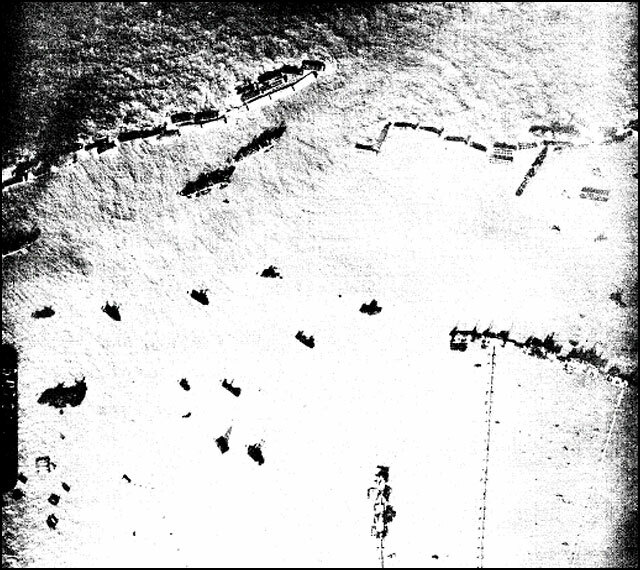 Shown here in a line are the sunken blockships and the reinforcing PHOENIX units. The protection afforded by this breakwater can be seen as the seas break on the units without disturbing the water within the harbour. This photo shows the effect of an October storm on the PHOENIXs at the eastern entrance. Several have been shifted out of line and one broken in two. It was discovered in June when the PHOENIXs were first sunk that the waves in breaking over the tops filled the compartments and created a terrific hydraulic pressure that tended to speed their destruction. How this could happen can be seen from this photo, looking down on these open PHOENIXs. To the right are more of the winterized units. This photo shows the roadways and spud pierheads of the West Pier, Central Pier and East Pier. The small dots beside the roadways are barges supporting a cable used to protect the piers from small craft. A partial view of the Blockships and PHOENIX is obtainable. The calm water in the harbour can again be noted. Here can be seen the Central Pier. East Pier and L.S.T. Pier. Beside the L.S.Ts. Pier can be seen spare WHALE equipment. A fairly complete view of the blockships is also shown. With the chart on the opposite page it is possible to compare MULBERRY "B" with all British ports and beaches. Of the 1,817,000 tons of British stores landed to 31 October, 615,000 tons or 35% came through the MULBERRY. 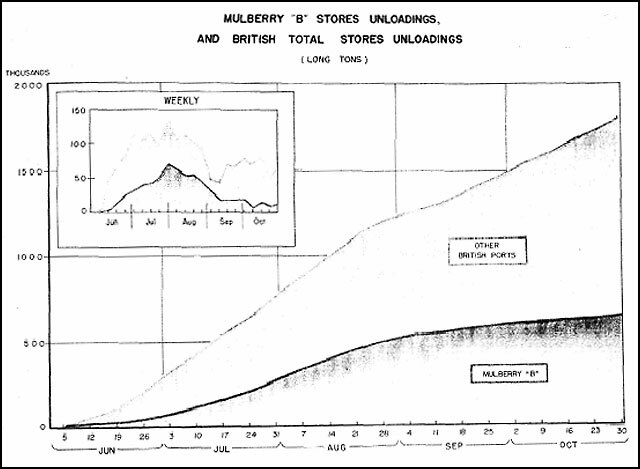 In the upper left hand corner of the chart the weekly unloading totals of MULBERRY "B" can be compared to the total British weekly unloadings. The influence of this one port during the months of June, July and August is strikingly evident. 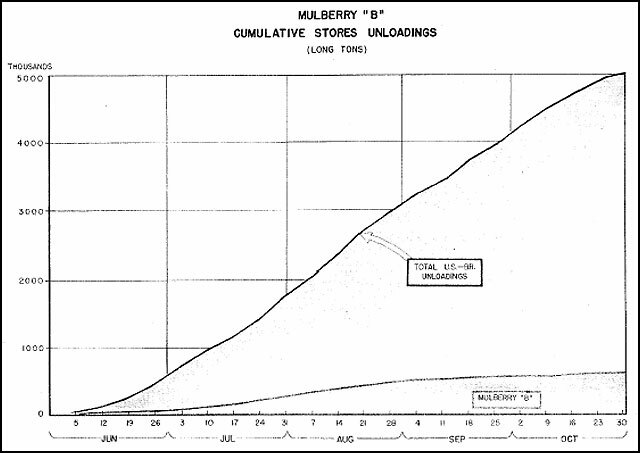 The peak was the week of 31 July when 71,043 tons were unloaded through MULBERRY; the peak day was the 29th July when 11,491 tons were unloaded. Of the 627,719 tons shown landed at MULBERRY "B", 13,120 tons represent U.S. stores. 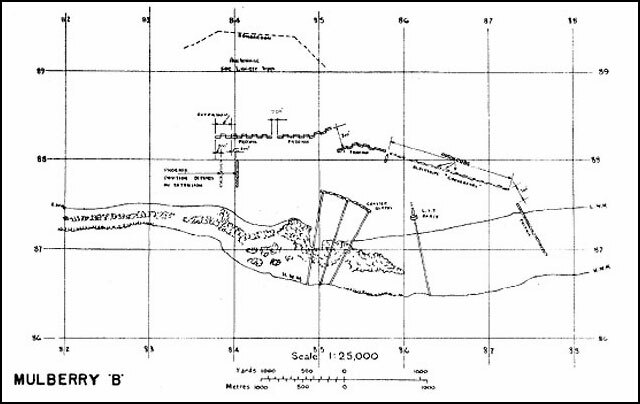 PERSONNEL LANDINGS AT MULBERRY "B"
Until the 24th of July MULBERRY "B" was used primarily as a stores port, with hardly more than 2,000 troops being landed and no vehicles. 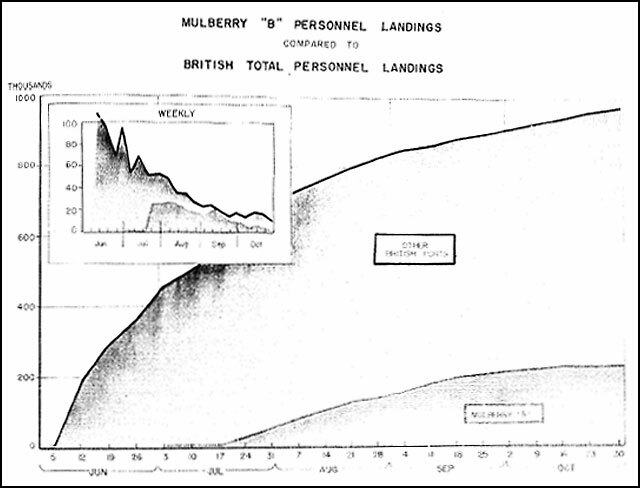 The small growth in the corner of the accompanying chart shows, however, the relationship of the personnel landed at MULBERRY "B" to the overall weekly figures after the 3rd of July. From the largest chart it can be seen that MULBERRY "B" handled about a quarter of all British personnel put ashore. From the chart opposite it will be noticed that the months of September and October are the peak months for vehicles landed at MULBERRY "B". From the 17th of July to the 31st of October a little less than 40,000 vehicles were unloaded at the port. 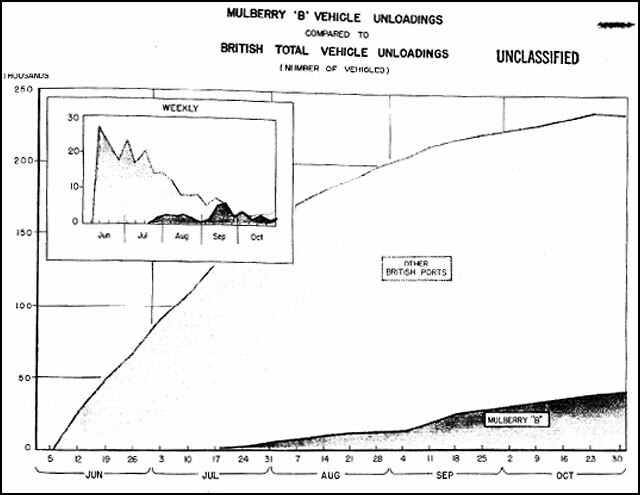 The attached chart shows the total number of tons of U.S. and British stores unloaded. Plotted with it are the unloadings at MULBERRY "B". To the 1st of November the combined forces had landed 5,214,000 tons of stores of which 628,000 tons, or 12% had come through MULBERRY "B". This is the story of the making of a port -- not of making ports, in the naval sense, but of making a port in the constructional sense. It starts with the British purpose, held with grim tenacity from the very morrow of Dunkirk, of re-entering and liberating the Continent from which we had been ejected. That purpose to be fulfilled required an amphibious operation on the very largest scale. Such an operation had to encounter one certain enemy -- the Germans; and one possible enemy -- the weather. If Corporal Hitler and General Storm happened to collaborate, the result might be another Dunkirk which it would take more years to redress. The obvious plan was to attack and seize some large port; but it was so obvious that the enemy had no difficulty whatever in providing against it. His whole strategy was based on the principle "Hold the ports and we can hold Europe". He could and did make direct assault from the sea impracticable. He could hope to ensure that flanking attacks would take so long that they could not survive heavy counter-attacks and would almost certainly find their supply lines disastrously interfered with by the weather. These considerations probably inspired Hitler's famous reference to "military idiots" after the Dieppe raid. He thought we were caught in a vicious circle "No port, no attack. No attack, no port". The "military idiots" however, were determined to square the circle, and their determination first leaked into print in a minute from the Prime Minister dated May 30th, 1942. Strategic sight has indeed to be long. The date of the minute was two years all but a week before D-Day. Here it is:--"Piers for Use on Beaches. They must float up and down with the tide. The anchor problem must be mastered. Let me have the best solution worked out. Don't argue the matter. The difficulties will argue for themselves". Here is the seed of the idea of building our own port but it was one thing to have the will and another to find the way. Long before the war there had been some advance towards designing a mobile and floating aerodrome; but who had ever conceived of a mobile and floating port? The ordinary port was static, and took years to build. It took seven years to build Dover, and something bigger and better than Dover was required. Therefore what had to be done was to pre-fabricate a port, in the safety of our own dockyards and factories, of a kind which could be towed to the place where it was wanted. to be done was the designing and construction of more than 150 large concrete caissons for the main breakwater; the preparation of sixty blockships displacing in all nearly half a million tons; and the manufacture of 10 miles of piers and causeways. The eight months between August 1943 and the time when the port had to be ready were filled with miracles of daring and compression in design and of skilled and arduous labour in construction. It would be invidious to mention some only of the hundreds who can claim a share in the working of these miracles. The most that can be said in a summarized story is that the floating breakwater was an Admiralty responsibility; the other components were, according to the plan settled at Quebec, the responsibility of the British War Office; and the work was carried out by the Ministry of Supply. All the components were designed and built in Great Britain. In August 1943 the Ministry of Supply received instructions to go ahead, and the building of some parts of the harbour was begun in the autumn; others, of more complicated design, could not be put into production until Christmas. The task was a heavy additional burden upon British industry, already strained almost to the limit by orders for ships guns, tanks and aircraft. For instance, the breakwaters, piers and pierheads made big demands not only upon labour but upon our reserves of steel. There were two main items involved in the construction of the ports. Firstly, the breakwaters to ensure shelter for unloading the numerous types of craft, including ocean going vessels, which necessitate deep water. Secondly, the piers for unloading the vessels with communications to the shore for transporting men and materials. The breakwaters were constructed of reinforced concrete units weighing up to nearly 7,0OO tons each, being 204 ft. long, 56 ft. wide and 60 ft. high. These were of monolithic cellular construction, and built in the form of a ship for floating to their destination. One hundred and fifty of these were required for the scheme, and as graving docks of the requisite capacity were not available for constructing the whole of the units, special basins had to be constructed behind river banks where the work was partially completed. The river banks were then dredged away and the units floated to wet docks for completion to their full height, and for fitting out ready for sea. Several firms of the leading consulting engineers were engaged for supervision on the various sites, and 25 of the leading firms of contractors were engaged. The work entailed the employment of over 20,000 men. The completion of this work within a few months, mostly winter months is probably one of the greatest construction achievements ever carried out in this country. The piers were all prefabricated, and consisted of steel pierheads placed out in deep water to enable vessels of large size to come alongside for unloading and they were connected with the mainland by flexible roadways running out from the shore. These involved the use of 50,000 tons of steel and the employment of 250 firms. of the pierheads and flexible roadways. In spite of the fact that the caissons were each as big as a block of flats, and some of them had to be towed down the Thames in full view of thousands of people, the Germans did not seem to guess what we were about, and the whole operation took them completely by surprise. A great deal of scientific research -- especially research into the behaviour of waves -- had to be carried out during the planning of the harbours. Special instruments were devised and assembled at a place on the Dorsetshire coast, and scientists working under the Admiralty's instructions spent months in a small secluded hut, watching these instruments and recording the readings. There were other problems of hydrography and survey. In peace time before any harbour construction was begun, months would be spent in carrying out a careful survey of the sea-bottom. But the areas where we proposed to lay down the ports were heavily mined, littered with obstructions, defended by E-boats, and immediately under the muzzles of German batteries. 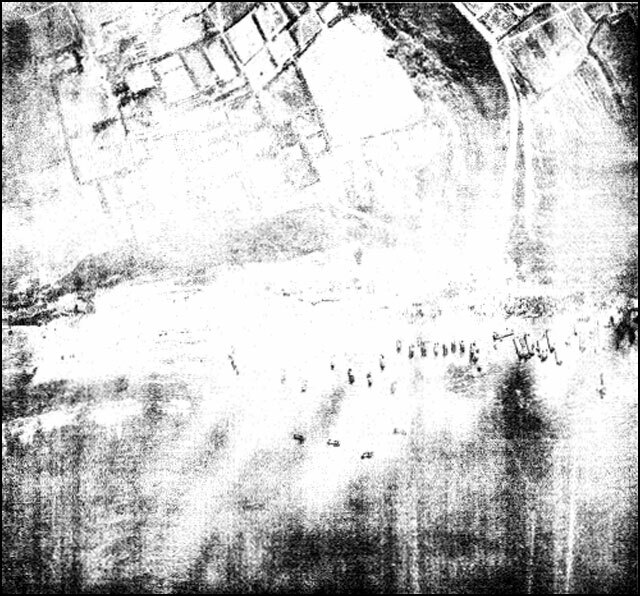 At first the planners had to work from old French charts, from intelligence reports, and from air photographs. 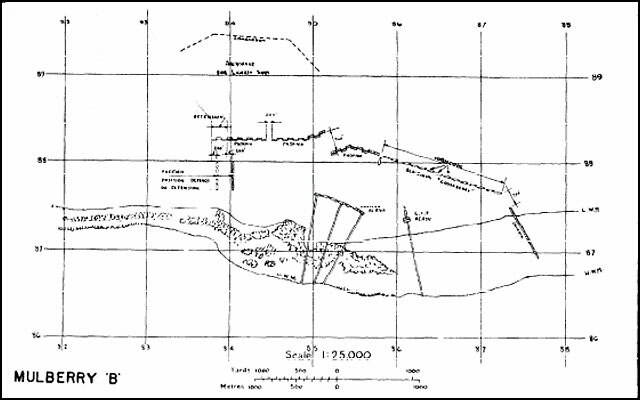 However, six weeks before D-Day, a survey of the Arromanches area was carried out in a small boat by an officer of the Royal Navy, (Lieutenant F.M. Berncastle, D.S.C., R.N.) who took a line of soundings and actually landed on the enemy coast. The information he brought back was invaluable and added much to our knowledge. The complete plan provided for the construction of two ports -- two prefabricated harbours each the size of Gibraltar -- and three additional "shelters", formed by lines of blockships, in the lee of which coasters and landing craft could continue unloading on the beaches even in unfavourable weather. Each of the harbours also included a line of blockships, which formed part of their breakwaters in the shallower water, the rest of the breakwaters in deep water being composed of caissons. Inside the breakwaters lay a system of piers. There was also an outer breakwater consisting of floating steel structures of a new and experimental nature. This part of the harbour -- like all the other equipment -- was designed to withstand a sea of the size normally experienced during a summer gale, and short trials under these conditions were successfully carried out. A complete harbour, therefore, consisting of blockships, caissons, and piers, would look like the accompanying diagram; but it was realized that this design might have to be modified in the light of events later. It was decided to set down one harbour in the American sector near Vierville-sur-Mer; and the other in the British sector at Arromanches-les-Paine where, curiously enough, the French had once considered building a harbour -- and had given up the idea. a factor with the settingdown which made it doubly difficult. In a sense the port must have not three dimensions but four; Time was the fourth dimension. It had to be done quickly -- and the quicker the better, for any day after D-Day a gale might spring up and cut the communications behind our troops before they had built up the dumps and depots which constitute their reserve of supplies. And there was another complication: the harbours had to be used all the time they were being built. We must have as soon as possible, protection for half a mile of shoreline and shelter for a thousand tons of small landing craft. Next we must have shelter for coasters unloading into barges and lighters. Next we must have piers, with pierheads at which ships could berth and unload into lorries; and finally we must have -- if possible -- shelter for the large Liberty ships. All these facilities had to be used as soon as built. The Army couldn't wait for weeks while the Germans built up forces for the counter-attack; and if it began to blow hard, the small ships couldn't wait for their shelters. Therefore the setting-down of the harbour was planned as an operation to be carried out as quickly as possible and in definite phases. The blockships, which could be sunk quickly, would provide the first shelter for the small craft; then the caissons would complete the breakwaters and provide a lee for the coasters; then the piers would be built within the shelter already provided; and so on. The Sinking of the Blockships. The first of the components to sail were the blockships, some of which were so old and slow that they had to leave port six days before D-Day. Both warships and merchantmen were used. The warships included the old British battleship Centurion and the cruiser Durban, the Dutch cruiser Sumatra, and the French battleship Courbet. The merchantmen sailed under the flags of nearly all the Allies and were manned by Merchant Navy crews. Some of the vessels were more than 40 years old; but every one of them reached its destination at the appointed time. They were sunk by explosive charges, and the whole of this part of the operation was completed during the five days following D-Day. Meanwhile the caissons, breakwaters, and piers were being towed across the 200 miles of sea at an average speed of 4 knots. The total weight of material involved was about l½ million tons; probably the greatest "tow" in history. 150 tugs, British, American, and Dutch, took part in the cross-Channel tow and in the subsequent "planting". The caissons were simply concrete chambers, oblong and flat-bottomed, fitted with a simple arrangement of valves so that they could be flooded to sit on the bottom or pumped-out at will. The largest caissons were 200 ft. long and 60 ft. high, and weighed nearly 7000 tons. They carried a small crew of sailors to manage the tow and soldiers to man their A.A. armament and work the sinking valves. The breakwater units were "ships" only in the sense that they floated, but in spite of their awkward shape they behaved like ladies when in tow. The piers, towed in lengths of 480 feet, the pierheads which weighed 1000 tons each, and the sections of breakwater, were all difficult tows, especially in rough weather. The tugs, naval, military, and merchant services played a most important part in the assembly of the components as well as in the final tow, and carried out a strenuous and sometimes dangerous job with patience, courage and skill. The Planting of the Harbours. 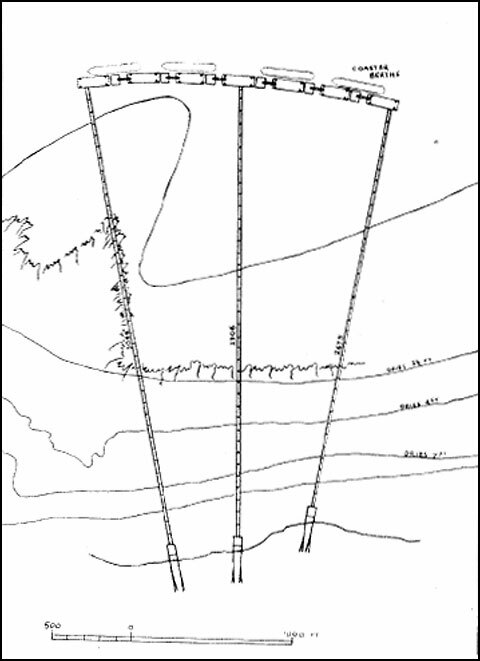 The "planting" of blockships and caissons in their correct positions was an extremely difficult operation, involving many problems of wind, tide, and sea-bottom. In the case of the breakwater units it could only be attempted in calm weather and in certain states of the tide. 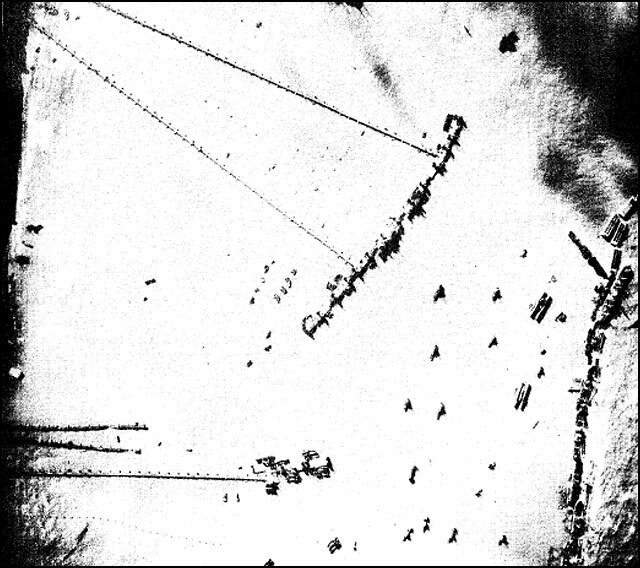 Nevertheless by D plus 8 the breakwaters had been laid and by D plus 12 more than half the caissons were in position. Meanwhile, port parties, landed in the early stages of the operation, had cleared mines, built roads, and blasted gaps in the "western wall" to receive the shore-end ramps of the piers. In the American harbour much of this work was done by "Seabees". The British port party included a naval beach commando and detachments from the Royal Marines and a strong force of the Royal Engineers. The setting-down of the harbour was a combined operation in which the Navy and the Army worked hand in hand: soldiers were sailors and sailors were soldiers, and Royal Marines were both. While the planting of the caissons continued, the Royal Engineers assembled the piers and pierheads, which fit together like a giant's meccano set. 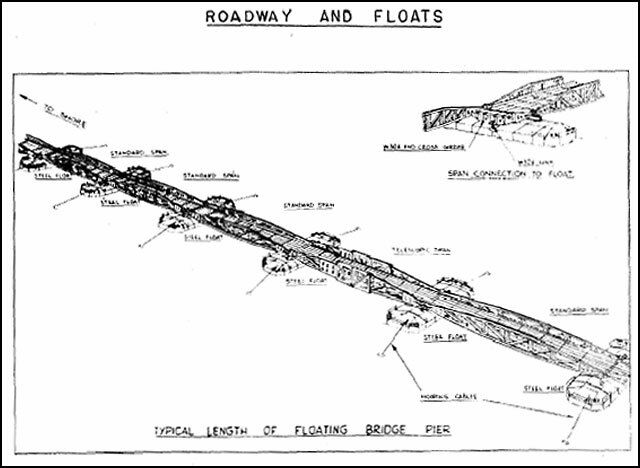 The piers are flexible floating roadways, causeways laid upon floats, an elaboration of the ordinary pontoon. The 80 ft. steel bridge spans are carried on steel and concrete floats and lined together by ball and socket joints to allow for the twist and sag of the roadway in heavy weather with telescopic spans to allow for tidal action. At the shore-end the piers are secured to heavy ramps; at the seaward end they are moored to the remarkable "spud pierheads" which are great floating platforms 200 ft. by 60 ft. with steel "legs" at each corner to anchor them to the sea-bottom. Their design is based on that of a certain type of dredger which rode a severe storm in the West Indies when all other shipping was sunk or driven ashore. On tow at sea the pierheads look like enormous tables, upside down, with their legs sticking up in the air. When they are laid in position, the legs are lowered, their steel "feet" settle deep into the sea-bottom, and the 1000 ton quadruped stands foursquare to wind and sea. Thereafter the pierhead slides up and down upon its "legs" and the whole structure of the pier rises and falls with the tide. There is a separate and special pierhead for unloading L.S.Ts. (Landing/Ship - Tanks) which is provided with a kind of artificial beach, a floating buffer pontoon upon which the L.S.T. can run her bows "ashore" to discharge her load of tanks and motor transport. Contractors working for the Ministry of Supply built 591 standard 80 ft. bridge spans, 89 telescopic spans, 230 steel floats, 250 concrete floats, 23 great pierheads with their complex electric winches, and to anchor the ten miles of pier they used 120 miles of steel wire. The system of piers was nearly half finished by D plus 12. Already it was possible at any state of the tide to berth coasters against the spud pierheads and unload them into lorries which drove ashore down 5/4ths of a mile of floating causeway. Other small vessels anchored in the lee of the breakwaters and discharged into DUKWs and landing barges. The harbours were already proving their usefulness. But on the 13th day after D-Day--on June 19th--a gale blew up from the north-east. It blew for three days: the worst June gale the Channel had known for forty years. Moreover, it came from the worst possible direction, piling up the seas on our north facing beaches and producing a barrier of surf through which no landing craft could venture without breaking its back. The harbours had been designed to insure against precisely this emergency; but unfortunately the sudden gale caught them before they were finished and before the whole of the breakwaters had been laid. Moreover, whereas we had taken the possibility of a summer gale into our calculation, this gale was of winter strength. An extremely dangerous situation arose. The breakwater broke up and ceased to give any protection. Both outside the harbours and within them there were ships in distress, ships dragging their anchors or whose anchors were already lost. These threatened further to damage the structure of breakwater and piers. The American harbour was the worse hit. Great seas surged through the gaps torn in the breakwater, drove small craft ashore, and seriously damaged the piers. Caissons which had been breached by pieces of wreckage began to crumble away. as well as many hundreds of troops, were landed at Arromanches over the pierheads. Next day, while the gale still raged, this was increased to 1200. 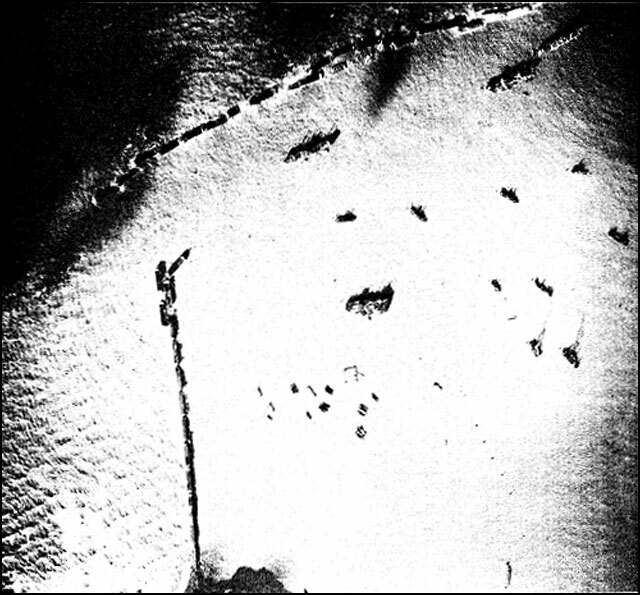 Great damage was sustained by the American harbour, which lacked the useful shelter which the Calvados reef provided for the British; and to make matters worse many of the components--caissons and lengths of pier--were lost or damaged while on tow in the Channel during the three days' gale. In view of these heavy losses or material it was decided to discontinue work on this harbour, which was now less necessary in view of the capture of Cherbourg. The main structure of the British port had stood up well to the weather, and the harbour was completed--partly with material salvaged from the American one. The work of strengthening its breakwaters is still proceeding. Meanwhile the port continues in full operation. Within its breakwaters Liberty ships and coasters discharge their cargoes into DUKWs and lighters; and against its pierheads other ships unload thousands of tons each day into lorries which carry the stores straight to the Army's dumps. For the first time in history, a harbour has been built in sections, towed across the sea, and set down, during a battle, on the enemy shore. Movements and Transportation Branch, S.H.A.E.F. See also Archeological Investion of the site -- with photos.